Coleraine picked up another three points with a hard-fought 1-0 win over Dungannon Swifts at The Showgrounds. Darren McCauley sublime strike 10 minutes before half time was enough to seal the points for the Bannsiders, who should have won by a bigger margin if truth be told. The hosts made a bright start with Brad Lyons forcing Stuart Addis into a save inside two minutes. The visitors responded with two chances inside a minute as Ryan Harpur placed a header wide before Grant Hutchinson forced Chris Johns into a save after a good move from the Swifts. Coleraine went close again on 26 minutes as Lyons tried his luck from distance, but it never threatened Addis in the away goal. The keeper was left helpless as the hosts broke the deadlock on 35 minutes. A Josh Carson cross into the box was only half cleared by Hegarty, and McCauley took a touch before lashing a low shot past the keeper into the bottom corner for his eleventh of the season. The Bannsiders almost doubled their advantage two minutes after the restart as Carson latched on to a loose ball on the edge of the box, but his pile driver of a shot whistled past the upright. Darren McCauley set off on a weaving run through the Swifts defence on 49 minutes beating several players before finding space for a shot, but he could not get any purchase on his shot and it was easily cleared. 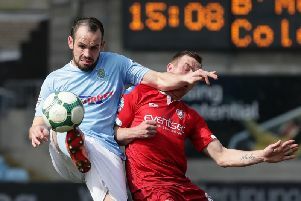 Oran Kearney's men had more purpose about their play at the start of the second half and went close again on 55 minutes after a short corner from Ciaron Harkin. He fed Smith, whose clever pass teed up Carson, but again he couldn't find the target. They spurned another opportunity to wrap up the game on 63 minutes as they broke on the Swifts goal. Brad Lyons won a superb tackle on the half way line to release McGonigle down the left, Carson was free in the middle for a tap in, but the striker delayed his pass allowing the defender to block the ball. Rodney McAree emptied his bench in an attempt to get back into the game and it almost worked on 74 minutes. Substitutes Peter McMahon and Ryan Mayse combined with the latter stinging Johns's hands with a powerful effort. Coleraine went straight up the pitch and wasted another opportunity as McCauley fired over after making space for the shot in the box. Mayse forced Johns into another smart save on 78 minutes after Cormac Burke had picked him out at the back post. The Swifts were almost caught out on 86 minutes as Smith's clever pass sent Lyons clear before he was obstructed by Wilson. Lyons stepped up to hit the set piece, but he could only find the wall. Two minutes later McCauley skied another effort after good play from Mullan and Carson, before Parkhill fired wide from the angle after rounding Addis.